Copyright © Bonnie Marcus. Images used with permission. 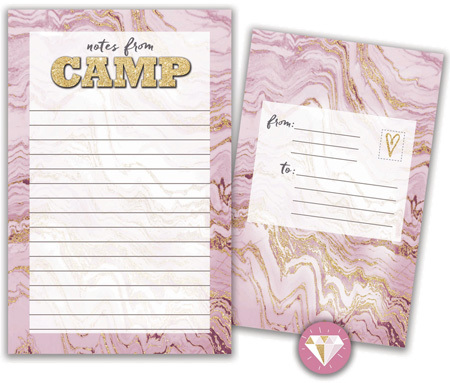 Your camper will love writing home on this Seal-N-Send stationery! Each set contains 20 recycled sheets (printed front and back) and 24 stickers (seals) packed in a clear bag. To mail, camper just folds the sheet twice and uses a sticker to seal! What a fun way for your camper to send correspondence to friends and family! Item available only as shown and not available personalized.